"In orienting oneself in this atlas...one is invited to fathom the many New Yorks hidden from history’s eye...thoroughly terrific." "The editors have assembled a remarkable team of artists, geographers and thinkers...The maps themselves are things of beauty...This is a work that, like its predecessors, isn’t in the business of rosy nostalgia...Nonstop Metropolis is a document of its time, of our time." "Rebecca Solnit and Joshua Jelly-Schapiro's collection achieves the trifold purpose that all good cartography does — it's beautiful, it inspires real thought about civic planning, and, most of all, it's functional." 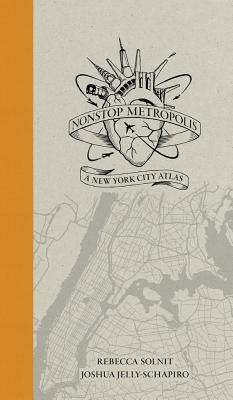 "...the New York installment [of the Atlas Trilogy] is eccentric and inspiring, a nimble work of social history told through colorful maps and corresponding essays. Together, Solnit, Jelly-Schapiro and a host of contributors — writers, artists, cartographers and data-crunchers — have come up with dozens of exciting new ways to think about the five boroughs." "The sum of it all is, like New York itself, overwhelming, alluring and dazzlingly diverse."